Jagannath Temple is one of the most renowned as well as the biggest temples of Odisha, so it is known as “Shree Mandir” in Odia. This temple was established in the 12th century, and dedicated to Lord Jagannath (Lord Krishna) who is known as the Lord of the Universe in Hindusm. The credit for laying the foundation of the Jagannath temple of Puri goes to Raja Ananta Varman Chodaganga Dev. The temple is located at a distance of 60 kms from Bhubaneswar, on the coast of Bay of Bengal, and is greatly revered by the devotees following the Vaishnava traditions. 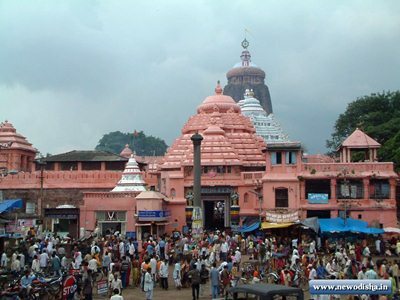 There is an interesting legend associated with the Jagannatha temple of Puri. It is said that King Indradyumna, the ruler of the territory, saw Lord Jagannath in his dreams and following the Lord’s wishes, as told to him in his dreams, he got the Jagannath Puri Temple constructed. Situated in the heart of the holy city, the temple is visited by devotees from farthest corners of India as well as the world. It exudes splendor and its tall spires lend it a magnificent aura. The walls are embellished with exquisite carvings. The pillars that provide support to the temple are adorned with pictures depicting the life of Lord Krishna. In the list of the most splendid monuments of Odisha, Jagannath temple occupies a supreme position. One of the most popular attractions of the Jagannatha Temple of Puri comprises of its Rath Yatra that is organized every year. It is basically a chariot festival, where idols of Lord Jagannath, Lord Balabhadra and Goddess Subhadra, the main deities of Srimandir, are taken to the Gundicha temple in bejeweled chariots and are brought back to the mandir in the same way. The deities of the Puri temple are generally known as the Trimurti(Trinity) though, to the scholars, they are Chaturdhaa murtis (or images, 4 in number). Some think that originally there was only Jagannath as the object of worship and when Neela Madhava disappeared, King Indradyumna fabricated the body of Jagannath out of a log of wood that was picked up from the sea, as per a divine direction received by the King. Scholars holding the view that originally the Present-day Trinity was not there, cite the example of a Temple found in the Cuttack District in Orissa (belonging perhaps to the seventh century A.D.) where the images only of Jagannath and Balabhadra have been carved and Subhadra is not to be seen there. It is, therefore, believed that when there was a great resurgence of Saktism from the 7th century onwards, there was a successful attempt to install an image of the Mother Goddess (Durga or Sakti) in the Puri Temple by the side of Jagannath. According to some others, installation of the image of Durga or Sakti (who is also known as Bhadraa, Mangalaa etc.) might have taken place during the visit of Sankaraachaarya to Puri. In the Konarka Temple built in the 13th century A.D. (about a century later than the Puri Temple), there is a panel of three images. Jagannath is seen in the middle and to His left is the Mother Goddess, while to His right is a Linga (phallus). From this, it is deduced by some that this might have been the “Trio” of the Puri Temple, indicating the equal importance of Vaishnavism, Saktism and Saivism. There is another hypothesis that Bhadraa or Mangalaa (Durga) came to be called as Subhadra and at the time of Vaishnavite preponderance, she was introduced as Srikrishna’s sister, whose name also is Subhadra. Similarly one of the names of Lord Siva is Veerabhadra. Somehow, at a time of Vaishnavic efflorescence, He was transformed into Balabhadra. (The second half of this name i.e., ‘Bhadra’ was retained and the first half was substituted by Bala). When HE was thus called Balabhadra, He, was introduced as the elder brother of Srikrishna. The majestic temple of Lord Shri Jagannatha at Puri is said to have been built by emperor Anangabhimadeva, It is described in Madala Panji, the temple chronicle of Puri that Anangabhima on contemplated to construct a temple of Srivatsa khandasala type with 100 cubits in height. But on the advice of the ministers and royal priests, the height was reduced to 90 cubits. Accordingly the temple was built, as it stands today. The temple consists of four structures called (a) the Vimana or Bada Deula sanctum sanctorum) (b) the Jagamohan or Mukhasala (the porch), (c) the Natamandir (the audience hall) and (d) the Bhogamandap (the hall for residuary offerings) built in a row in an axial alignment in east-west direction. The temple faces the east. The Vimana is constructed in Pancharatha (temple containing five Pagas or segments) Rekha order. Rekha is the name given to a type of temple with a curvilinear spire. Out of the five Pagas or segments, the middle one is known as Raha, the two feanking pagas as Anuraha, and the two corners as Kanika. Like a full-fledged Orissan temple, it has four-fold vertical divisions, i.e. the Pitha (pedestal), the Bada (wall), the Gandi (trunk) and the Mastaka (the head). The temple stands on a high pedestal though a major portion of it is buried in the ground. The visible portion shows three mouldings, which are richly carved. Similarly the Bada is Panchanga type i.e. consisting of five elements known respectively as Pabhaga (foot), lower Jangha (shin), Bandhana(bond), upper Jangha and Baranda. The Pabhaga consists of five usual mouldings and these mouldings are connected with vertical bands in each Paga of the Bada. These five mouldings are known in the architectural texts as Khura, Kumbha, Pata, Kani and Basanta in ascending order. Every day 5 bhogas are offered to the Lords, these are “Gopala-Ballava” (Break fast), “Sakal Dhupa” “Madhyana Dhupa” “Sandhya Dhupa” and “Badasinghar Dhupa”. According to the Skanda Purana, Lord Jagannath redeems the devotees by permitting them to partake his Mahaprasad,to have his darshan and worship Him by rituals and offering gifts. Mahaprasad is treated here as ‘Anna Brahma’. The temple kitchen has got the capacity to cook for a lakh of devotees on a day. Mahaprasad is cooked only in earthern pots and on hearths. 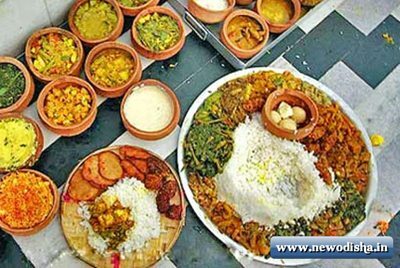 The steam-cooked food is offered to Lord Jagannath first and then to Goddess Bimala after which it becomes Mahaprasad. This Mahaprasad is freely partaken by people of all castes and creeds without any discrimination. The items offered include cooked rice, dal, vegetable curry, sweet-dishes, cakes etc. Dry confectionaries are prepared of sugar, jaggery, wheat flour, ghee, milk etc. When the steam-cooked food is carried to Lord in slings of earthern pots no flavour comes up from the food but when the same is carried back to the sale point after being offered to the Lord a delicious smell spells along in the breeze to the pleasant surprise of the devotees. Now the food is blessed. Mahaprasad consolidates human bond, sanctifies sacraments and grooms the departing soul for its journey upwards. Mahaprasads are sold in Anand Bazar or the PleasureMart of the temple which is situated on the northeastern corner of the outer enclosure of the temple. Most of the residents in and around puri depend upon this Mahaprasad to entertain their guests during social functions such as thread ceremony and weddings. The tourists prefer to carry a particular type of dry Mahaprasad known as” Khaja” (made of maida,sugar and ghee) which stays fresh for days together. 1.Gajapati Maharaja 2. Parichha or Raj Guru 3. Chhatisha Nijog Nayak (the head of the Servitors) – Pattajoshi Mohapatra 4. Bhitarchha Mohapatra 5. Talichha 6.Mudrahasta or Mudirasta 7. Deula Purohit 8. Puja Panda 9. Badapanda 10. Pushpalaka 11. Mahajana 12. Mudra 13. Khuntia 14. Bhandara Mekapa 15. Palia Mekapa 16. Akhanda Mekapa 17. Changada Mekapa 18. Khataseja Mekapa 19. Pratichari 20., Daita 21. Pati Mahapatra. 22. Patribadu 23. Garabadu 24. Suarabadu 25. Khurinayak 26. Mukhapauhala 27. Ghatuari 28. Gochhikara 29. Suna Goswami 30. Muduli 31. Alatibalita Sevaka 32. Puranapanda 33. Duttamahapatra 34. Lugadhua and Pani Kunda Sevak 35. Ballava Jojania 36. Bimanabadu 37. Anasara Sudasuara and Suda Suara 38. Hadapanayak 39. Bidia Jogania 40. Khatuli Sevak 41. Astana Pratihari 42. Kothabhog Jogania 43. Pradhani 44. Paila 45. Lenka 46. Suaranijoga Nayak 47. Suaranijoga and Mahaswara 48. Jagia Mahasuara 49. Badu Suara, thali, tuna and Amalu Suara 50. Pantibadu 51. Amalutola, Purakharadi 52. Tolabadu 53. Rosha Paika 54. Baharadeuli Suara 55. Baharadeuli Jogania 56. Rosha Dhopakhalia, Angarua, Gobarapania and Rabadia 57. Handi Jogania 58. Birimunda Samartha 59. Kothabhoga Pania 60. Panikipata 61. Nikapa and Gandhana Nikapa 62. Biribuha 63. Daudibala 64. Churana 65. Sabat Nijog 66. Pania – pata 67. Mandani 68. Chakaapasara 69. Mulia Suansia 70. Binakara 71. Darpania 71. Kothasuansia 73. Mahabhoi 74. Gita Govinda 75. Bhitara Gaini 76. Sanpradanijog 77. Dayanamali 78. Madei 79. Prasad badu, Badu Mohapatra 80. Tatua 81. Patara bandha 82. Vijayanti 83. Chhatara nijog 84. Kahalia 85. Sankhua 86. Parbajatra Jogania 87. Chitrakara 88. Rupakara 89. Bania 90. Tamara Bisoyi 91. Karotia 92. Bentabindha Paika 93. Patara Bisoyi 94. Kala Bethia 95. Daraji 96. Kumbhara Bisoyi 97. Rathabhoi 98. Malachula 99. banua 100. Chakra dihudi 101. Ojha Maharana 102. Ghanta Seva 103. Gantua 104. Ratha Dahuka 105. Badhei 106. Baidya 107. Amunia Chhatara 108. Chhamu dihudi 109. Chapa Behera 110. Chapa dalai 111. Mapa Saita Karana 112. Tadhau Karana 113. Deula Karna 114. Baithi Karan 115. Kotha Karana 116. Charcha Karana 117. Daina Pattra 118. Chaula Bachha Karana 119. Matha and Byaktigata Seva. As it is one of the famous temple of Odisha as well as in India, so this temple is well connected will all types of transportation facility. You can easily reach this temple through Bus, Car, Train etc. The nearest airport is Bhubaneswar, from there you can easily reach this temple through Bus, car and train. 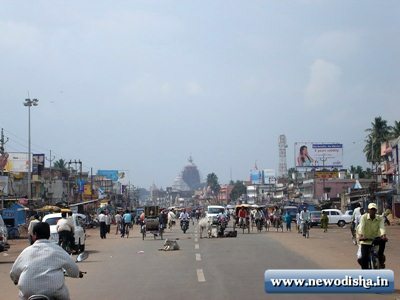 There are many Hotels, Lodges, Dharmasalas and Guest Houses near Puri Jagannath Temple. So you can easily get good accommodation with all facilities in very cheap price. Give Responses for "Lord Jagannath Temple of Puri"